No, not a bad thing at all. I imagine you are as vigilant as I am - with all our piggies, but I'm especially attentive to Dak and Dash. I agree, I think the maturing process is what's happening. It does make me a little sad, though (and I try not to think about it) - but the older they get, the more I know we're pushing the limits here. Every single day feels more and more like a blessing as they get older, I guess. Jacqueline, try not to think too much about that. Don't waste the here and now by worrying about the future. I'm one to speak cos I'm probably the same as you. My wee girl just went through surgery and she was 4 last month. Have to say, I hate it when I talk about my piggies and someone asks how old they are, then in the next breath it's "so what age do they live to?". I always say up to 7! No! 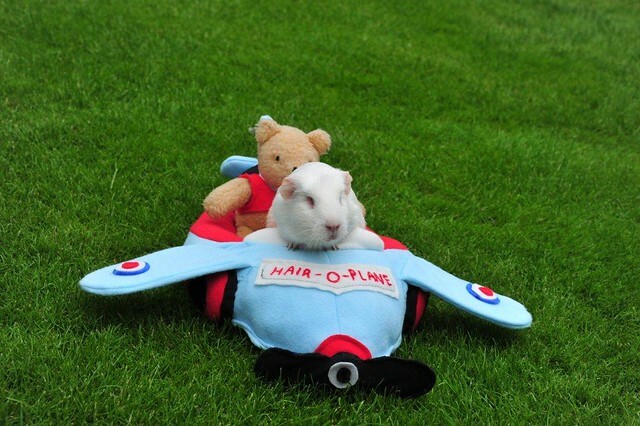 Not flying lessons, we all know Fairy has her pilots licence anyway! I think it helps me to think about things like you do, Jacqueline, and I was only talking to Ian about this the other day. I think about it and look at our girls and KNOW that they have the best life possible, each and every day, every minute, is the best it can be for them! I still have moments though . . .
Fairy is an adventurer alright! Yes, Mildred. Every once in awhile - just a moment. . . I love it when Fairy is in her aeroplane or her bright yellow car! What a mighty little navigator! Do they let Mr. Bear fly? Or drive? Mr. Bear tipples too much to be allowed to pilot anything, even the wagon! Didn't he drive the honeymoon cart? Some nosey friends asked my mum recently 'Where does Fairy sleep'? As if that is anyone's business but my own. I will tell you anyway, but only if you are nosey enough to read on . . .
First off the important bits - getting me fed! This photo was from a while ago, didn't I look cute? I still do I expect. Once my tummy is suitably filled I get my superior Daddy-cuddles. 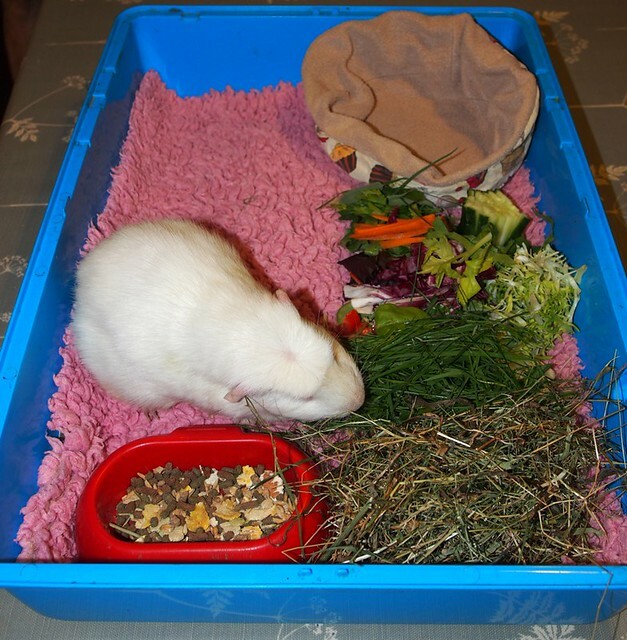 Then it's into my bedroom where I find supper has been laid out along with a tasty heap of hay - and my jolly yummy snack bowl has been topped up with the finest super-snacks! All present and correct then. Oh and look here, some fresh grass. Could life get any more perfect? On goes my handy keep-Fairy-free-from-draughts device . . .
. . . then another little back rub! I like this best best! Into position now, a heated underblanket and the warm stove . . .
. . . and a bit of distance between moi and that pesky pair, Pixie and Bear. Oh, that looks very, very snug and cosy! I can't believe all those treats so close at hand! I suspect if MildredM was caring for me (in a somewhat Bigger box), there would, of course, be a nice selection of chocolates and perhaps a cup of hot tea at the ready. I would be happy next to the heater. Mildred - I'm curious about their sleeping arrangements. The two others don't come over to Fairy and pester her? Where do Pixie an Bear sleep? Was there any initial reason you had Fairy sleep separately? Thanks! A cosy human sized box with tea and chocs close to paw sounds bliss, Lynx! 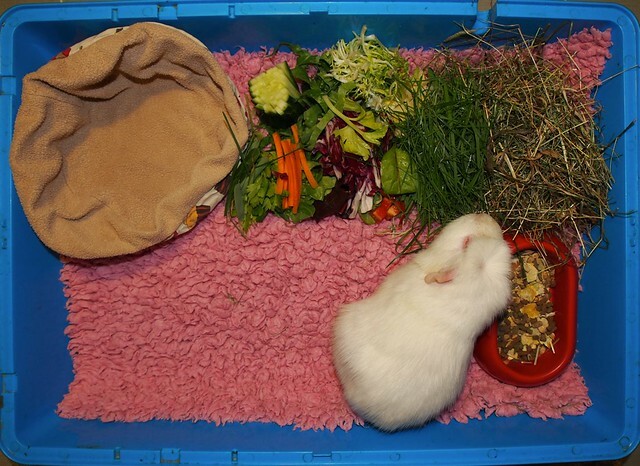 Fairy has always slept on her own in her bedroom box. 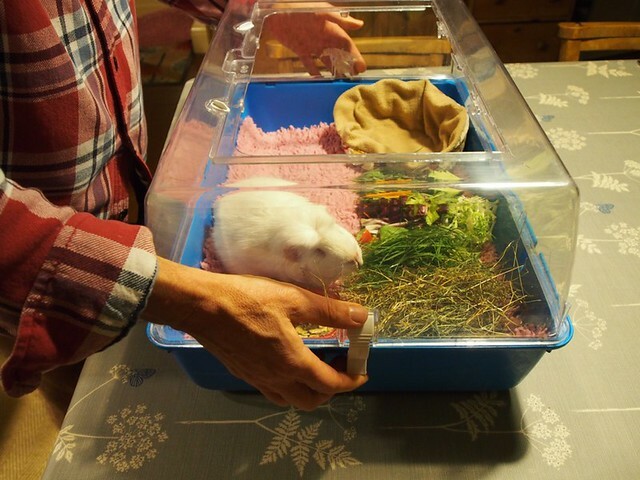 When she was a Baby she wouldn't settle down and just kept marching round and round when we tried to leave her with the piggies at that time, Marigold and Matilda, so we bought the box. She looked so teeny in it back then. Not only did it seem to comfort her it meant she could have her own pile of sliced up small salads and take her time munching them! 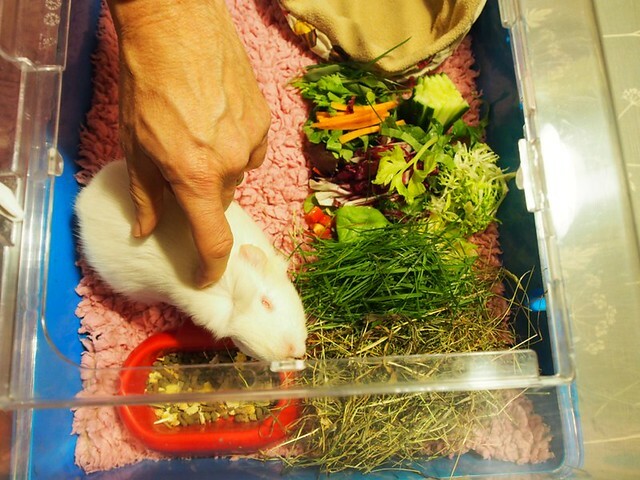 Being a piggy of habit she has carried on using her box overnight. She seems to really appreciates the safe feeling the box gives her - and she doesn't get nudged by a couple of bulldozers when she isn't . . . Err . . . 'Sniffing'! 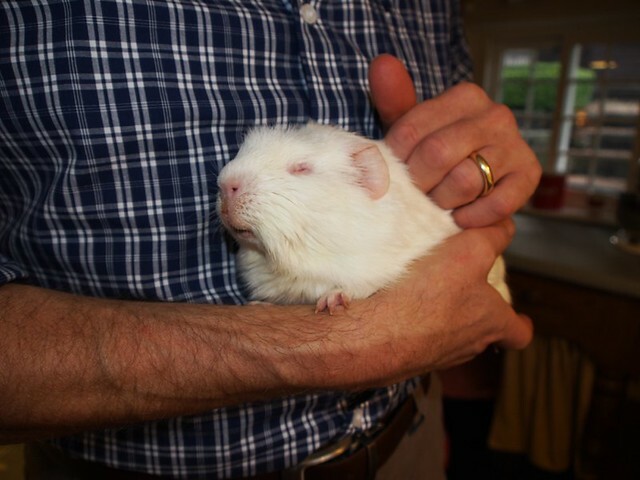 No, Bear and Pixie, or any previous guineas, haven't ever tried to bother her. 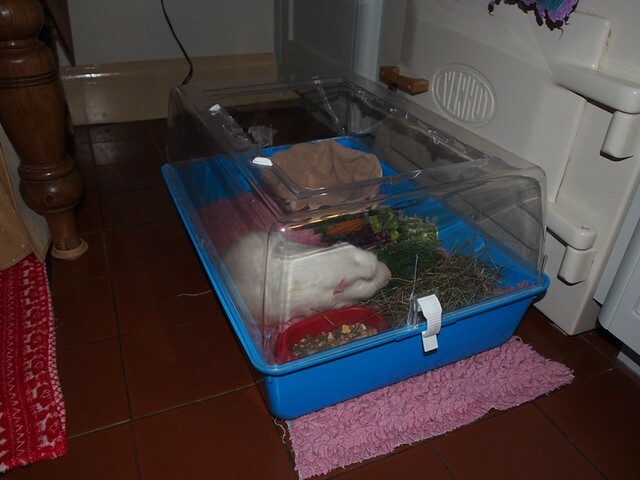 In the morning I take the lid off and push the box a bit nearer, then P and B hop in and check she hasn't left a morsel! They are always careful not to nudge her if she is still asleep!! When it's time to get up Fairy climbs aboard Ian's hand for a cuddle and by watching this Pixie will do the same and Bear is doing her best to learn. P and B snooze under the orange stool where there's a double layer of vet-bed. Mildred, they have such a wonderful life with you. 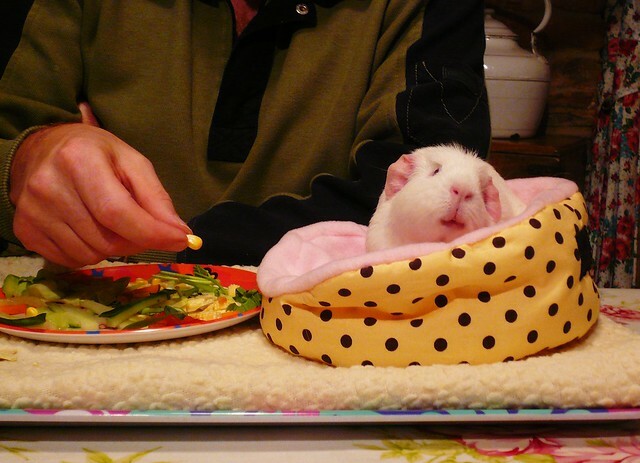 What guinea pig could ask for anything more! 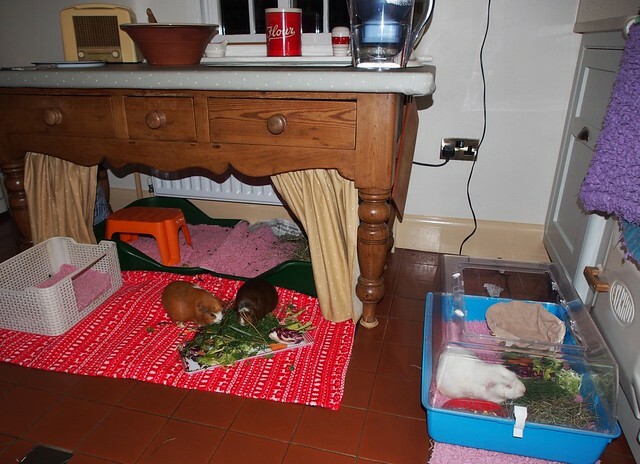 Hope you have a big dining table and plenty of room Mildred cos I think we all want to spend Christmas at yours with our piggies as it all sounds so cosy. We'll all be there, Mildred. Just so you know. And Lynx, you know your chocolates will be chopped into matchsticks?